Being a leader in the industry, we are engaged in offering a qualitative range of Multi Pin Car Chargers to our customers. We are a well known firm engaged in the provision of premium quality KEM Dual USB Car Charger with Emergency Hammer. As an important entity of this domain, we present patrons with the superior quality of Mobile Car Charger. - Some applications are laptop charging, small appliances like small fans, hand vaccum cleaner, lights, kitchen appliances etc. Bullet Micro Charger lets you charge your iPod or iPhone in your car at the fastest possible speeds. Its low-profile design allows the charger to sit flush with your dash, so it's conveniently out of the way yet still easily accessible. 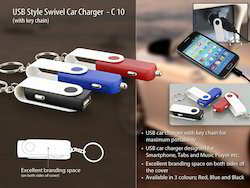 We offer a range of Car Mobile Chargers to a large number of clients in the domestic market. 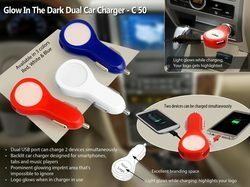 Our Car Mobile Chargers are easily affordable. Our range of Car Mobile Charger is known for its unexceptional quality.